The men’s season begins in just a few weeks (Nov. 5th)! Of course, the first official team event is the pre-season parent meeting, which you can read more about below. Every year the men’s team holds a pre-season meeting to answer any questions about the upcoming season and set expectations. This meeting is mandatory for every swimmer and at least one of their parents to be on the team. We’re excited to be able to offer online payment for season fees and all apparel items! Images of all the apparel items can be viewed online but please bear in mind exact printing colors are hard to replicate on screen. Apparel orders will close on Friday, October 19th at noon. This includes the team bundle. Mandatory Team Bundle – $58: This includes the team suit and a team shirts. Other years, the bundle includes travel food costs for out-of-town meets but this year the team has no charter bus meets. Varsity-only meet(s) will collect money for pizza on the day of competition (typically $5/swimmer). Team Warm-ups – $100: While these are optional, 100% of the team has ordered them in previous years. With proper care, they should last all four years of high school swimming*. Note – you’ll need to add the jacket and pants to your cart separately because this allows to choose different sizes for each (if needed). 2018 EXTRA Team T-shirt – $14: Team t-shirts commemorate the season. Pick your size from the drop-down list. Remember – each guy gets one in their bundle to wear at team functions (like the Winter Sports Kick-off). 2018 Team Sweatshirt – $32: This year’s team sweatshirt is a lightweight jersey hoodie. Pick your size from the drop-down list. 2018 Team Sweatpants – $20: Cozy and warm! Perfect for after practice and meets. The classic style was a team-request! Pre-meet Bag Dinner Add-On: Studies have shown having a balanced meal before competition improves performance. Otherwise there’s a long gap between lunch and the post-meet dinner around 7:30pm. Add this to take the work out of pre-meet fueling. Speedo Vanquisher Goggles + Bungee – $20: Save a trip to Elsmore Swim Shop. You can get your goggles/bungee from practice on a first come, first serve basis. 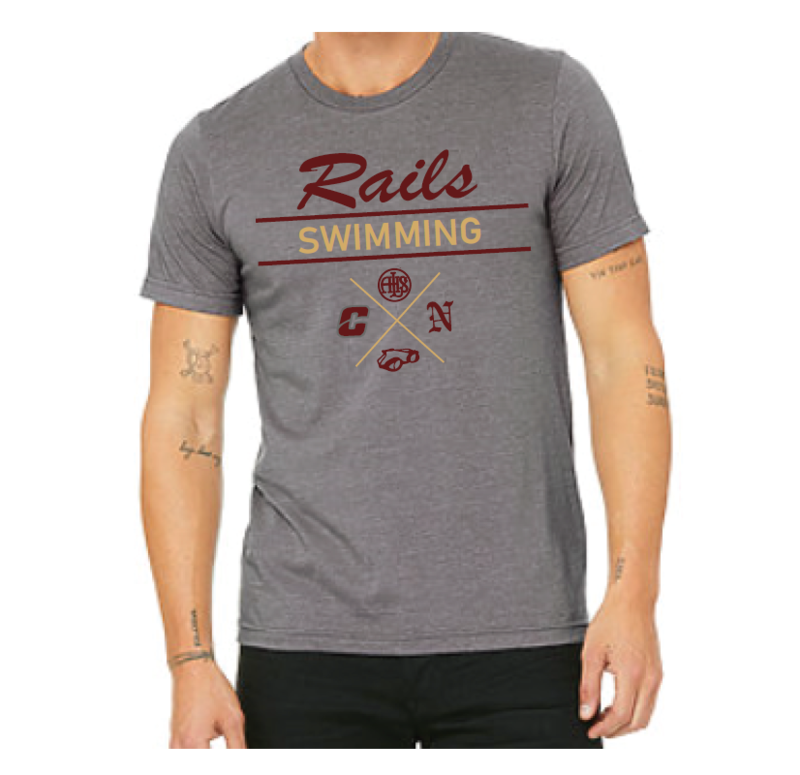 Fan T-shirt – $13: Show your LHS Rails pride in the stands. We love filling the stands with maroon and gold and this is a great way to do it! We encourage this shirt as the “standard” meet fan shirt, unless otherwise noted, because of its bold letters and maroon color. The fan t-shirt is used for several seasons so you’ll only need to buy it once. The prior design was used for 10 seasons! Wondering about GOLD OUT shirts? Those are typically reserved for a special meet and/or championship season. These will be offered for sale later into the season.